There are products which are used to straighten hair such as flat iron and other hair products. However, most products can easily irritate or damage hair and scalp. Fortunately, you still have plenty of options to straighten your hair naturally by using ingredients available at home. 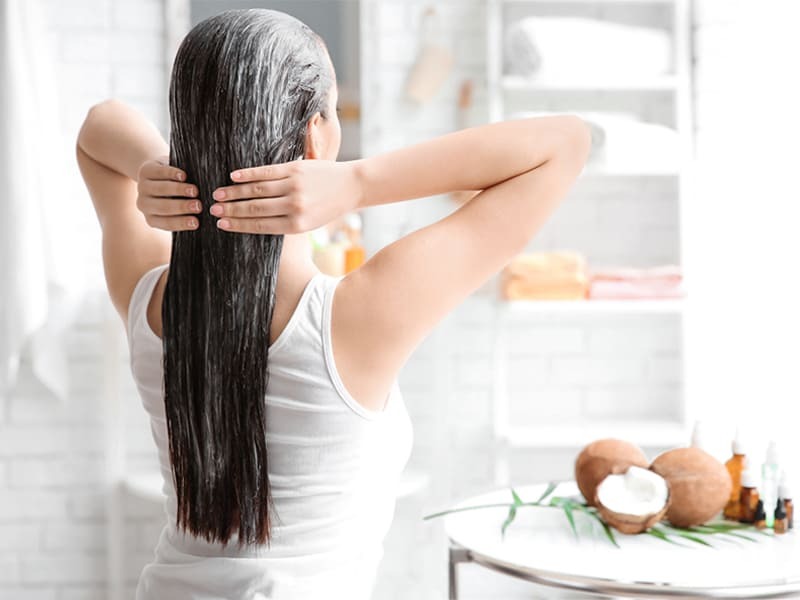 Although it is difficult to achieve straight hair just by natural processes, these methods will moisturize without damaging the hair due to the effects of chemicals or heat. It is the reason why how to straighten hair without heat will show in the post. There are a lot of simple and easy ways to straighten hair without heat. Wash your hair and use conditioner for your hair. First, you should use a mild shampoo and moisturizing conditioner to keep your hair moist. Avoid using shampoo with surfactant or sulfate because they damage the hair. Use a gentle towel to soak the hair dry. Do not rub hard into your hair to avoid breakage and tangles. You only need to gently squeeze the hair sections with a towel to dry the water. You should use the comb with sparse teeth, so it will untangle the hair without breaking the hair. Then you will use a regular comb to smooth the hair smoothly. Divide the hair into two sections to tie. Each section of hair will be tied to the nape of the neck. High column hair will leave folds when hair is dry. Use a hair band to hold the hair securely. Add some hair ties to the hairline. You can hold the towel firmly with a toothpick. Silk will keep hair from getting tangled when dry and reduce fiber hair. The thicker the conditioner and the deeper the moisturizer, the less the curl of the hair will be reduced. It will keep hair in place and straightening longer. Put dry conditioner in the palm and apply it evenly to wet hair. This will create pressure to straighten and not tangle the hair. If you do not want to use commercially available conditioner, you can use natural oil. To be specific, using thick oils such as argan oil or olive oil will be more useful for thick hair. On the contrary, thin hair will need lighter oils such as grape seed oil or coconut oil. If you have thicker hair, you can divide your hair into six parts. Use a round brush to comb a part of the hair. If you feel uncomfortable sleeping with a clamp on your head, wrap the towel around your head to create a smooth feeling. Avoid using shampoo with surfactants or sulfate. If possible, use a shampoo specifically for dry and damaged hair. When using shampoo and conditioner, you avoid scrubbing your hair vigorously as this causes hair to break and tangle. Use a towel to dry the water in your hair gently. Apply dry oil or natural oil from hair roots to hair ends. Use a wide-toothed comb to smooth the hair. Manipulate on each section of hair about 5cm wide. Use a sharp-edged handle to divide the hair into small pieces. Place a large batch of hair close to the top of the hair and roll the hair into the lot toward the scalp. Use the most significant roll you can find such as Velcro. 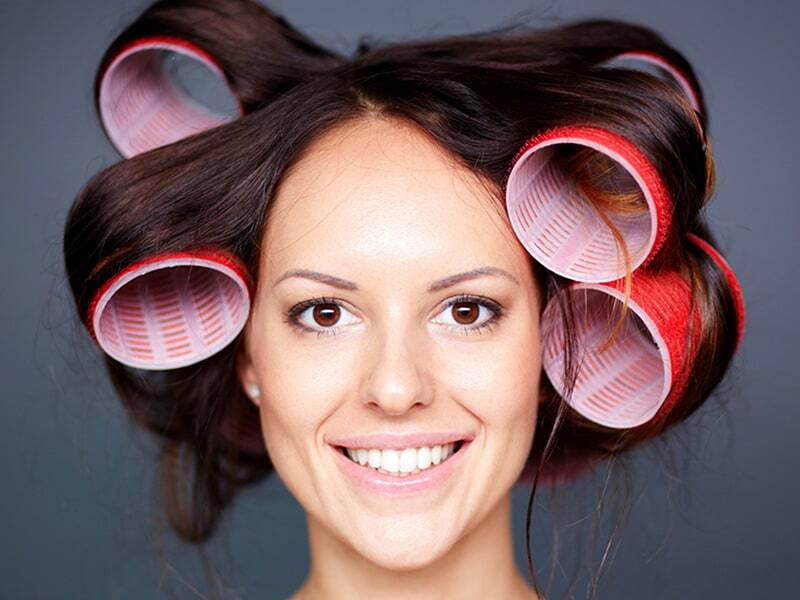 If you plan to roll your hair to sleep, you should choose a soft roll. Fix the roll at least 2.5cm from the scalp. Use a toothpick or plastic clip to hold the roll. In the number of lots that wrap slightly close to the head will help straighten the hair underneath the scalp without making the hair too bulging on the top of the head. You can dry your hair if you are in a hurry but only use a low heat mode to avoid damaging your hair. Dry hair will cause pressure on the roll to straighten the hair gradually. 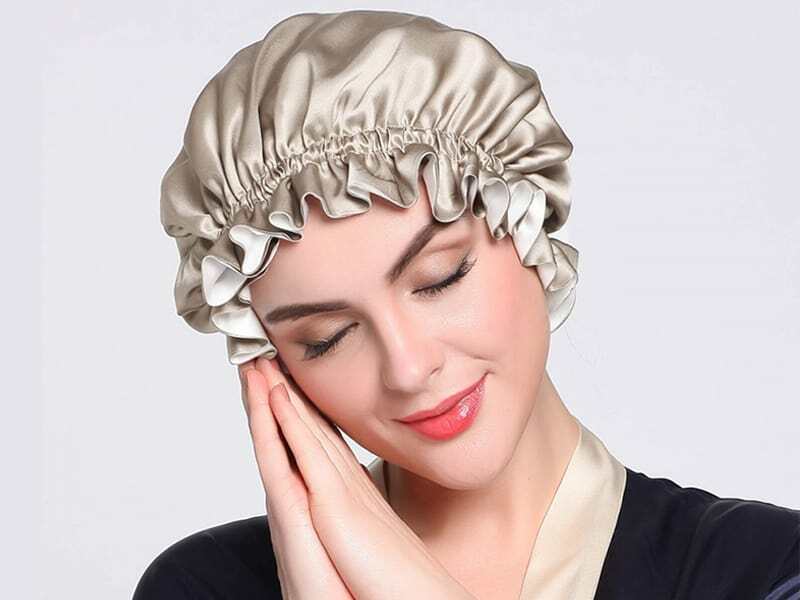 Furthermore, if you plan to go to bed with a roll wrapped around your head, you should wrap a soft towel, and preferably silk. Consequently, friction between the hair and the pillow causing the hair to tangle and roll offs the hair. Do not pull the roll away from the hair because this damages the hair. In contrast, you should gently remove the roll and let them slip out of the hair. Using natural ways is known as the best way to straighten your hair without chemical or heat. As you know, coconut milk is high-fat fiber and nutrients such as vitamin E which are suitable for moisturizing hair. Moreover, when coconut milk combined with the super moisturizing ability of pure olive oil and acid in lemon juice will create a straight hair mask. However, people with dyed hair should not use lemon juice because it makes hair fade quickly. Take another bowl and mix three tablespoons of cornflour with four tablespoons of lemon juice until the mixture is smooth. Stir the cornflour mixture with lemon juice into coconut milk. Turn the stove on medium heat and stir the mixture evenly until it thickens. When the mixture is as thick as a conditioner, lift the pan off the stove and let it cool. You can use a baking brush to apply more efficiently or use your fingers to apply the mask evenly to your hair. Make sure the hair is evenly covered to get the best effect. Wear a shower cap on your hair. If you don’t have a shower cap in your home, you can also wrap your hair with the wrap. Wrapping your hair will help keep the heat warm, making the curls straight. If you have a dryer, let it work in low mode until the hair is warm. Or you can warm a damp towel with a microwave and wrap it on your hair. Wash your hair with mild shampoo and warm water. More importantaly, avoid shampoo that contains a large volume of surfactants and sulfate. They will make the hair cut into a lumpy, ineffective moisturizing and smoothing of the mask’s hair. Use a deep moisturizing conditioner instead. Step 7: Brush for straight hair. Finally, use a fine brush to comb out tangled hair and gently pull for straight hair. 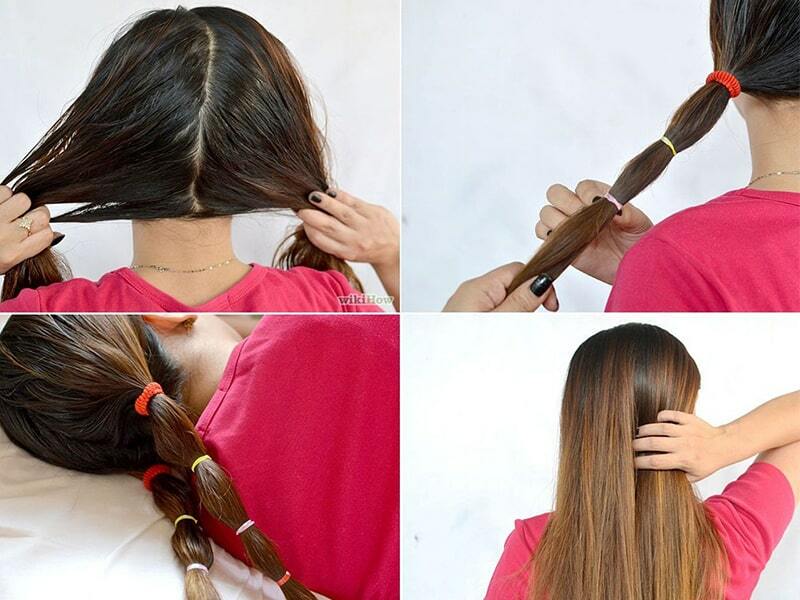 Hope that after the post, you will know how to straighten hair without heat with a simple and easy way at home. Don’t forget to visit our blog to get more useful tips or necessary information to take care of your hair. Follow Layla Hair for more information on hair care and hairstyles!